Property Details: 1 Bedroom, 1 Bathroom Vacation Rental, sleeps up to 6. Pelican Beach Resort condo, beach resort home in Destin. This fine Pelican Beach unit has been completely renovated. Enjoy breathtaking views of the Gulf of Mexico from a private eighteenth floor balcony where you can sit back and relax over the emerald green waters. This unit offers all the fine elements as well as everything you will need to feel right at home. The living area has upscale tiled floors, a fine sleeper sofa, and a contemporary elegant design throughout. The kitchen offers full size new stainless steel appliances and all the housewares you will need to make family meals. There is a nice glass dining table for four as well as three barstools at the granite breakfast bar for plenty of seating. The master suite has a king sized bed, nice quality modern dark wood furniture, designer bedding, and en-suite master bathroom. The master bathroom offers a shower/tub and granite sink. There is a twin over twin bunk bed in the hall with fine bedding. The second full bathroom is in the hall and offers a granite sink and a glass enclosed shower. For your convenience, there is a coin operated laundry room on each floor. You will find a DVD player and two large smart flat screen TV's in this fine unit. Make this gorgeous unit yours for your next dream beach getaway! 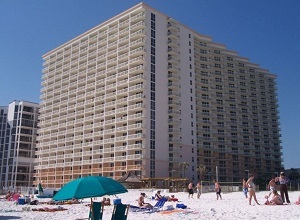 Pelican Beach Resort Condo Rental in Destin FL.